FG soccer Soccer cleats are essential when you are going to be playing one of the most popular sports in the world today. The best soccer cleats are designed to give you optimal traction no matter what the condition of the pitch you are playing on. The cleats on your shoes are protrusions at the bottom which is what provides that traction you desire. 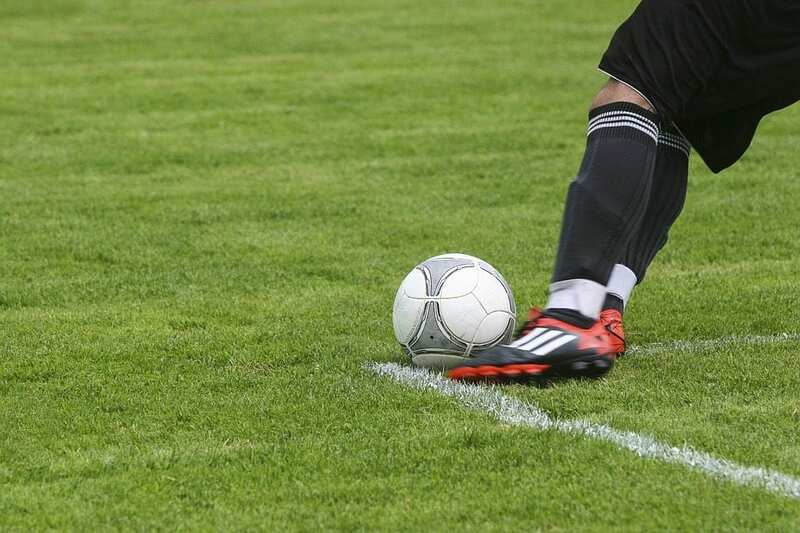 In this article, we examine the different types of soccer cleats that are available. You may wish to look at our review of the top indoor soccer cleats. We consider the material they are made from, the different lasts or styles available, that what kind of traction they offer you, and what surfaces they are perfect for. What Soccer Cleats are Best for Forwards? View the Best Soccer Cleats in 2019, Below. The shape and style of the cleats or studs will make a huge difference in the way you play, and the stability they will offer on the pitch. 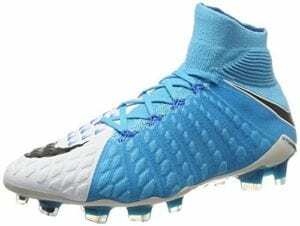 After extensive research, reading numerous online reviews, watching YouTube videos and checking out customer’s comments on popular sites, we have come up with a list of the ten most popular soccer cleats on the market in 2019. Soccer is the known as the Beautiful Game around the world and it is one of the most popular and played sports there is. No matter if you are young or old, new to the game or a professional, you need a great pair of soccer cleats to enable you to get the most out of your game. When you are considering which cleats will suit you there are a few things you need to consider. If you play Lacrosse, we’ve completed a review of the top lacrosse shoes you might be interested in. The type of surface you will be playing on, your own style of play and the position you will be playing in are just three of the important factors to consider. Material and sole construction of the cleats are two more important considerations. Different styles of cleats are designed for different aspects of the game. From control to power and speed are all needed when playing soccer, but when you play in different positions one may be more vital than the other. Their studs are designed to cut into the ground giving you a lot more traction in these conditions. AG or artificial ground cleats are one of the latest editions to the soccer cleat family and as there are a lot of players who now play the majority of their games on artificial pitches, these are turf surface shoes are in demand. Although VI FG soccer cleats can be used on artificial ground, AG cleats should not be used on firm ground natural surfaces. HG or hard ground cleats are for those that play their soccer on hard, dry surfaces. They usually feature conical studs that are designed to allow you to have great balance and control. These types of cleats can also be used on firm ground pitches. There is a range of materials that are used in the manufacture of soccer cleats ranging from K-leather or kangaroo leather to purely synthetic materials. All of the different materials have their pros and cons and the type of material you prefer will depend on your own tastes and preferences. K-Leather is one of the most popular materials used in the high-end soccer cleats. However, the price of cleats that use this kind of material is rather high. But the up side is that this material molds to your foot and provides exceptional durability and comfort in your boot. Natural leather is usually calfskin or goat level and these give you shoe a great feeling and a lot of durability. They can, however, be slightly heavier than other boots and they are a lot more expensive. Synthetic leathers are the cleats of the future. Nike and Adidas have adopted this kind of material to produce their high-end performance shoes which, although do not give you the natural and soft touch of the genuine article, technology is enabling it to become more and more like real leather in these aspects. Synthetic and mesh materials are a new and completely different type of uppers. The sole of the shoe is imperative and hold the key to your stability and performance on the pitch. The structure and design of the studs from conical studs to the blade, as well as the manner in which they are configured on the sole plate, will make all the difference. Different positions require different configurations of studs, some will allow for explosive runs, some for firm traction to enable you to plant your foot nicely and clear the ball from your lines. When you are a midfield player you might be an attacking midfielder or a center midfielder and each of these positions require different skills and different types of cleats. An attacking midfield player will require a cleat that allows for exceptional creativity. These are the soccer players that create the chances that lead to goals. They also have the double responsibility of defense and goal scoring. Ball control in this position is vital, so having a cleat that allows for the best touch and feel, as well as superb traction is essential. The center midfielder, on the other hand, needs to have a boot that offers speed, as well as great touch and superb traction. 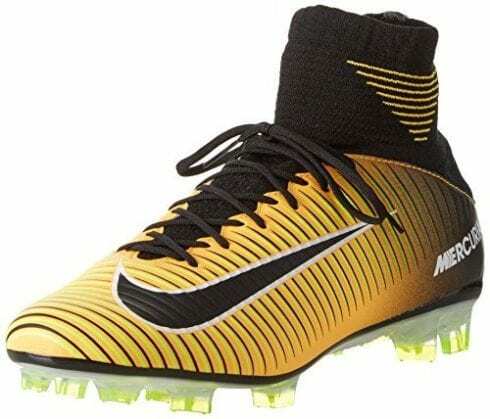 They also need a cleat that is extremely comfortable as they are the work engine on the field, moving up and down at great pace and always on the go, from defending to scoring. Some of the great midfield soccer players include Gennaro Gattuso, Steven Gerard, and Andrea Pirlo. All of these soccer players have the killer instinct needed to score and the tenacity to stick to attackers and defend like trogons. This is one of the most vital positions in soccer encompassing the whole spectrum of skills and an all-around boot is the best for midfielders. 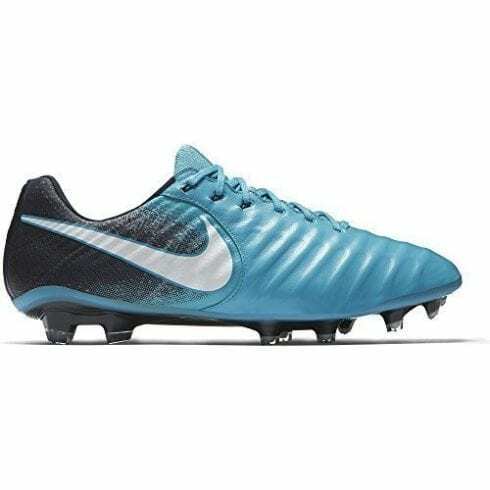 The NIKE Tiempo Legend VIII FG soccer cleats are one of the best pairs of cleats for midfielder soccer players around giving optimal control coupled with exceptional traction. Defenders whether they be left or right defenders, are the backbone of any soccer team. Often this position on the field is underrated but it is by far the most difficult, and influential positions on the field of play. Fullback is there to defend their goal against players like Lionel Messi and Christiano Ronaldo, this is not an easy task. They are also required to get down the field and provide the soccer balls to these attacking players, giving them opportunities to score. Along with midfielders, these are playmakers on the field. Fullbacks or defenders require cleats that offer consistency. They need a cleat that offers all-around performance. Touch and feel are essential as they are fast moving and need to be able to control the ball with precision. They also need to be able to speed up and down the field, providing the perfect scoring opportunity for the forwards, while defending their goal with tenacity at the other end. Traction in a defenders boot is vital. They need explosive push-offs and firm stances when dispatching the long ball upfield. When looking at a soccer cleat that offers all of this and more you can look at the PUMA One 17.4 VIII FG which combines explosive speed with touch and is extremely lightweight, designed for those players who are constantly on the move. This is the showcase player on the field. The ones that score the goals. They are creative and fast and need to make the speedy runs, tacticals, and precision passes as well as powerful shots at goal. Lionel Messi, Oscar, and Cristiano all have one thing in common. They are the creative geniuses who mastermind the perfect attack that results in spectacular goals. The ideal boot for this type of player is one that has exceptional touch. This is vital if you are going to inspire that one moment of magic on the field that wins the game. You need to be able to control the ball to get past the dogged defenders who will be marking you one on one. Power is another essential in a forward players boot. You must be able to make that one shot count. Striking the ball with great power is what scores goals. Style is another factor. Your boot must instill a sense of foreboding in your opponents, telling them that you are here to do the business. A great boot for a forward player and one that the little master Diego Maradona along with a number of other greats used for generations is the Adidas Mens Copa Mundial soccer cleat. 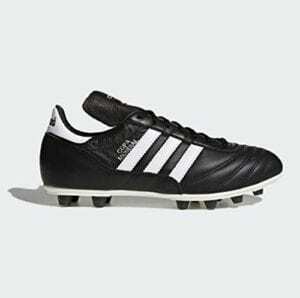 Adidas has been producing outstanding sporting shoes for generations and the Copa Mundial soccer shoe was released in 1979 and transformed the football world. Copa Mundial is the Spanish word for "World Cup" and was specifically designed for the FIFA World Cup in 1982. Over the years the Copa Mundial has been tweaked to keep up with the change in technology and when wearing these great mens Copa Mundial soccer cleats you will be in the company of Zinedine Zidane, Diego Maradona and more. The Adidas Mens Copa Mundial soccer shoe is constructed from Kangaroo leather with a synthetic lining which adds comfort and offers extra support. It offers extra leather supports which start at the heel and which are included to ensure not only stability on the field but also great durability. The K-leather will mold to your foot and will give you a glove-like fit which gives you great touch and feel for ultimate control over the ball. The synthetic lining that is offered is quick-drying keeping your feet cool and dry throughout the game. The tongue of the Copa is long and can be worn in different ways according to your own preferences. The Copa Mundial soccer footwear offers a Die-cut EVA insole. This is incredibly lightweight and offers optimal comfort for the player. The dual density, the direct injected outsole of the Adidas will ensure not only the best traction on firm surfaces but also a great fit and the best comfort in a soccer cleat. The fit of the shoe is superb and there is no "break-in" period required. The last of the shoe is superb, molding to your foot from the start. When sizing the shoe you may need to look at a half-size down from your normal sizing. The three stripes of Adidas are recognizable on any soccer pitch and the Copa Mundial is one of the best Adidas soccer cleats available on the market. The Nike log or Swoosh is by far one of the most recognized brands in the world. It is connected with the best athletes in a number of sports including with the beautiful game, soccer. Nike has designed soccer cleats for many years and has refined and perfected their construction to give you the edge on the pitch. The Hypervenom Phantom III Dynamic Fit is one of the best soccer shoes in the world, and although they may cost a pretty penny, they are well worth every cent. The Nike Hypervenom offers a one-piece, tongueless construction which is designed to almost eliminate seams adding to your ability to control the ball with great precision. They are constructed to offer superb breathability, support and stretch with a Flyknit upper. The lockdown of these awesome soccer cleats is designed to keep your foot securely in the shoe with the Flyknit upper combined with Flywire cables. The collar of the shoe is tailored for more stretch. Support is exceptional which the ridged knit area of the shoe which is designed to be tight at the top, but also allows for great ankle pivots and will not put pressure on your Achilles. The insole of these nike mens soccer cleats is engineered to give you the utmost comfort. The foam pods in the shoe will soften the impact of the ball, allowing for great touch and feel. They are also designed with a hybrid plate which will flex allowing for agile movement and powerful shots. Offering great energy return the insole of the shoe provides you with comfort and support throughout the game. The outsole of the shoe is designed to give you the best grip on firm surfaces. The studs are designed in chevron and hexagonal studs. This design allows for great foot movement and agility when attacking. The fit is of the nike mens shoe is superb with Flywire cables which wrap around your midfoot, this allows for excellent lateral lockdown and your foot remains stable and secure in the shoe at all times. The dynamic fit of the cleats offer you some of the best ankle movement control and will support quick turns. There is almost no break-in time on these NIKE soccer cleats. The dynamic fit of this soccer cleat is just what you need to lift you game and take it to the next level. Locks down your feet into the shoe and provides some of the best traction there is keeping you stable on your feet as you cut and weave your way past your opponents. One of the third largest sporting goods manufacturers in the world PUMA is born from a family feud between two brothers, both of whom went on to great heights from their start in the 1920's forming the companies Adidas and PUMA. Technical innovation and new designs such as vulcanization of the soles of the boots have lifted PUMA into the upper echelon of soccer cleat manufacturers and their boots are worn by some of the top soccer stars in the world today. Replacing the leather with synthetic materials has brought down the cost of this soccer cleat. The PUMA One V III FG soccer cleat is a hybrid of the Puma EvoSpeed and PUMA EvoTouch combining both great cleats' features into one, making it one of the best cheap soccer cleats around. 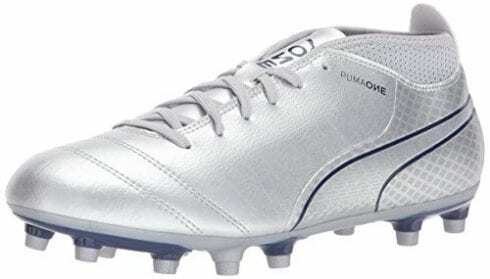 PUMA has replaced the Kangaroo leather on their previous soccer cleats with a very flexible and lightweight synthetic material that allows for a great, comfortable fit. The Puma One still maintains evoKNit sock extension for great comfort. The insole of the FG soccer shoe has great cushioning in all the right places. It is designed to keep your foot comfortable and supported throughout the game. The outsole of the FG soccer cleat is designed for explosive speed, comfort and great traction on firm surfaces. They have bladed and conical studs, and are designed to allow you to change direction quickly as well as engineered for explosive take-off and acceleration. The heel, which is synthetic, combines with eh sole plate to give you excellent stability especially when turning and planting your foot for shooting. The fit is superb. The evoKNIT collar on the shoe will provide one of the best around, while the synthetic upper material allows for a molded fit to your foot keeping it stable and supported. The size of the shoe is often about a half size smaller than what you would normally wear as it runs a little long. When looking to purchase a soccer cleat that offers you all the features of a high-end shoe at a fraction of the price, you need not look further than the PUMA One 17.4 FG. Offering stability, support, comfort and superb ball control. The synthetic upper is unique in design and looks incredibly stylish to boot. When Lionel Messi puts his name on a shoe you know you will be getting a quality soccer cleat that is designed for the player who is a forward and loves to score goals. They are engineered to offer the touch and feel you need to control the ball with precision, sending it flying into the top corner of the net and defying the goal keeper's best attempts to stop you. Leaving your opponents in the dust you get the best ball control as well as the ability to make moves which will let you breeze past defenders, leaving them flat-footed and flabbergasted. The agility mesh upper of these great soccer cleats makes them both breathable and supportive, with the added advantage of being extremely durable. They offer great touch and allow for superb ball control. The dual lock collar of the shoe offers great lockdown, keeping your foot securely in the shoe along with ankle stability which helps to prevent injury. The synthetic and textile lining of the insole of the soccer cleat is designed to keep your foot comfortable and dry throughout the game. The EVA insole footbed is well cushioned and constructed for the best support in a soccer cleat. The outsole is designed according to Lionel Messi's style of play, aggressive and fast. The MessiGAMBETRAX outsole is not only lightweight but offers excellent control. The studs on the shoe are designed to perform at their best on firm ground and will definitely allow you to get the best grip possible. The stud configuration is engineered for you to be able to get explosive push-offs, allow you to change direction and to plant your foot firmly for the perfect shot at goal. The fit of the Nemeziz Messi 17.3 FG is like a glove on your foot. The will mold to the shape of your foot and require little to no break-in time at all. They will not constrict the movement of your foot, allowing for great agility and excellent control. Messi is one of the best in the game and this shoe bears his brand and is designed to offer you the speed and agility on the pitch with almost no break-in time. A lightweight, superbly designed shoe for forwards to use to improve their game and make their mark on the pitch. Another great offering from Nike and much like the Nike Hypervenom Phantom III Dynamic Fit it will lift your performance on the pitch to new levels allowing you to excel. They are constructed and designed using innovative technology that makes them perfect for all types of conditions. Cristiano Ronaldo, who lends his name to this Nike Mens mercurial shoe, testifies to the ability of the cleats to allow for tight turns, cuts and explosive take-offs. The uppers of the Vapor IX are engineered to deliver you excellent support and formidable control over the ball. The touch and speed of the shoe are phenomenal and perfect for those like Ronaldo, who have the skill and pace to leave defenders in the dust. The Speed Control textured uppers combine friction with a molded fit to make it extremely responsive and offer great touch. The construction includes great lockdown to prevent the foot from moving inside the shoe. The All Conditions Control (ACC) technology that is used on these soccer cleats will ensure that the shoe is capable of performing both in wet and dry conditions. The insole of the shoe is well cushioned and provides for shock absorption. It provides for a soft heel which adds to the comfort of the soccer cleats. For the player like Ronaldo, speed and agility are everything on the pitch. The Vapor IX offers twin studs at the rear of the shoe will allow for a fast release from the surface. The design of the actual stud which is asymmetric offers the ability to make explosive push-offs and the blades ensure you can change direction or pivot at lightning speed while remaining stable. The lightweight plate on the outsole of the shoe is constructed from glass fiber which makes it extremely flexible and allows for superb energy return. These Nike cleats will give you the boost you need when you need it. The fit of the soccer cleat is snug and tight which makes it extremely responsive and gives the player the soft touch needed to control the ball with precision. When the Nike Mens Mercurial Superfly shoe released over 10 years ago, it was innovative and exciting and the Vapor IX has just improved on that wonderful history to provide a boot that not only stands out on the pitch but will help you lift your game to new levels of excellence. Another stunning addition to the Mercurial range and one of the soccer cleats that bear the Cristiano Ronaldo name. They are a more reasonably priced option to the Superfly, offering a similar style and of course a great performance. The construction of the mens soccer cleats is as good as it's top of the range brother. It is constructed from synthetic materials. The 3D Speedribs offer excellent ball control, with a soft touch and the ribbed material ensuring that your passing ability is unsurpassed. The strike zone is layered with extra material and therefore provides a lot of impetus behind your shots. It also offers a little more protection and you will not feel the hit as much as on the Nike speed shoes. The insole of the shoe is very comfortable and supportive. The toned down anatomical plate offers a lot less undulation, it still contours to the foot but eliminates the gap underfoot. This area of the shoe is a little thicker and acts as the spine of the shoe creating some stiffness. This stiffness, however, will start to soften quickly as you wear it. The heel of this shoe is well padded and not as high as the Superfly. The chevron blades on the Veloce III ensure that not only can you dig into the surface for secure footing when shooting or long-range passing, but also releases quickly to allow for speed and good range of motion. The traction on the shoe is phenomenal and you will remain stable and secure no matter the surface you are playing on. The Finite Element Analysis used to determine where the grip is most needed has worked wonders and the pattern on this shoe is designed for the speed player. The fit of the shoe does not require much "break-in" time, however, they are a narrow fitting soccer cleat. The fit of the shoe is extremely snug with very little wriggle room. If you have a wide foot, however, if you have a medium to wide foot you should be able to wear the cleats in comfort, the length of the shoe remains true-to-size. 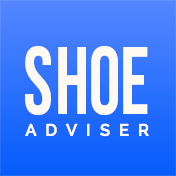 The material of the shoe does not stretch much at all and will remain tight, this can cause a little bit of discomfort in the beginning when putting the boot on, however, it does become easier to slip them on over time. Offering some of the most secure footing you can get to allow you to breeze past your opponents. Almost no "break-in" time required, superb construction and a snug fit that provides the comfort you need to get you through the game. The Tiempo Legend VIII (know previously as the Nike mens tiempo legend VI) unlike some of the previous Nike cleats we have featured has a leather upper and not synthetic. These Nike mens tiempo legend VIII cleats are stunning to look at and even more stunning to play in. Offering the traction, speed and ball control everybody wants. Lightweight and durable these shoes are some of the coolest soccer cleats on the market and will make you stand out in more than one way on the pitch. The construction of these Nike mens tiempo legend cleats is from kangaroo leather which is ultra-soft and will mold to your foot nicely creating a snug and secure fit. This type of leather upper adds to the touch and feel for the ball and offers superb control. The construction of the heel and midfoot is flyknit with Flywire cables that wrap around the foot creating a lockdown effect to keep your foot stable and secure in the boot. The flyknit of the heel and tongue of the shoe are breathable, stretchy and offer the best support in the areas that you require it the most. The flywire cables also integrate with the laces to enhance the lockdown. The insole of the nike mens tiempo shoe offers NIKEGRIP technology and this technology uses interlocking textures that are designed to stop your feet from slipping or sliding inside the soccer cleat. The stability pods inside the collar cup offer superior support for your ankle. The sockliner on the shoe is designed to reduce the pressure that the studs put on the foot. The grip on this great soccer cleat is enhanced by the hyperstability plate which offers you a lightweight traction that gives you secure footing on firm ground. The plate with its underfoot studs is perfect for natural grass surfaces. The fit of the Nike mens Tiempo shoe is snug and secure with the flywire and sockliner adding to the secureness of the fit. There is very little break-in time needed with this shoe and it is ready out the box for players to use. The snug fit of the cleats ensures a secure and stable fit that offers great overall support. The shoes are striking in design and color. They fit snug and secure keeping your foot stable and supported. These are great shoes for wearing on natural grass pitches and will enhance your game taking it to a new level. PUMA has designed some of the most dynamic and technologically advanced soccer cleats that are worn by some of the best footballers in the world. The PUMA Mens Evopower Vigor 4 Graphic is another of PUMA's great soccer cleats. They offer stability, support and superior comfort with a design give you enormous striking power. The PUMA Mens Evopower Vigor is the perfect entry soccer cleat that comes at a reasonable price and great features. The construction of the PUMA Mens Evopower shoe is both soft and durable with a synthetic upper that is both lightweight and molds to your foot for optimal stability. It offers a soft feel for great ball control. The construction of the shoe is designed to make you feel like you are kicking barefoot. The powerCell design is engineered for power and precision kicking. It is suitable for use on natural surfaces, and is known as a firm ground cleat. The insole of the PUMA Mens Evopower shoe is soft and comfortable. The Foamstrip at the lateral side of the shoe is there for comfort and the PUMA evoPOWER Logo on the tongue of the shoe is designed for extreme comfort. The outsole of the shoe is a rubber sole. The TPU outsole is both lightweight and stable. The bladed and conical studs are designed to offer optimal agility and stability. The fit of the shoe is snug and comfortable. It is designed to lock your foot into the shoe and have a sock-like barefoot feel to it. There is little break-in time required for this shoe and can be worn straight out of the box in comfort. The synthetic upper of the shoe molds to your foot and is soft and comfortable. The lace closure on the shoe offers a tight, snug and secure fit. Power, stable, agile and perfect for the entry-level player playing on firm natural surfaces. The PUMA soccer cleats are lightweight and durable and will offer great balance, agility, stability, and accuracy to the player. Speed and power are the hallmarks of this great mens soccer cleat. A well-priced, entry-level soccer cleat for the player that needs all the features you get with the performance soccer cleats but without the price tag that goes with them. The fifth edition of the NIKE Mercurial Superfly CF7 is sure to get your tail up on the pitch. This is possibly the fastest boot in soccer and combines technology with style to give you a complete soccer cleat that Cristiano Ronaldo is proud to put his name to. 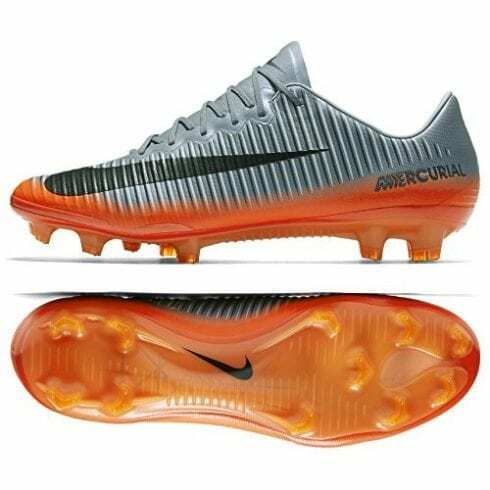 Speed, dexterity and a real feel for the ball is in the makeup of this Mercurial Superfly soccer cleat and it is arguably one of the best pairs of cleats for soccer in the world. This boot is an eye catcher and will definitely let you stand out on the pitch. The upper of the Mercurial Superfly soccer cleat is textured flyknit. 3D Speedrib texture creates areas on the leather upper that are raised and this will provide a certain amount of friction between the shoe and the ball allowing for much more control. The Mercurial Superfly soccer cleats have thicker material in the right areas which allow for a more solid feel and in turn a stronger connection with the ball and with the texture, you can kick with more power and curve the ball at will. 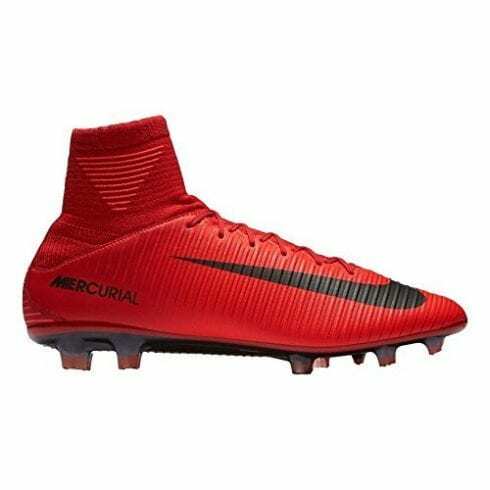 These Nike Mercurial Superfly soccer cleats are extremely comfortable and cushioned in all the right areas. The dynamic mid-cut collar of the shoe is stretchy to allow for quick entry into the shoe and the footbed is padded and undulated for protection and comfort. The internal heel counter is exposed to the heel and keeps your foot snugly secure in the Mercurial Superfly shoe. The mercurial anatomical plate is what makes these NIKE soccer cleats stand out. The soleplate makes all the difference, it aligns itself with the contours of your feet and cuts out the gaps that used to exist. This plate along with the stud configuration are sure to give you the best traction on most firm ground pitches. The fit of the NIKE soccer cleats is rather tight when you slip them on for the first time. Getting your foot in the boot can be a squeeze, but this snug fit throughout the shoe allows for the stability you get. The stretchy upper Flyknit material will mold to your foot making it an extremely comfortable cleat once it has been worn in. The shoe runs true to size but does require a break-in period to get the perfect fit. A visually stunning NIKE soccer cleat that combines technology with flair to give you a speed-focused players dream boot. High performance, coupled with style, stability, support, and comfort makes this one of the top soccer cleats for explosive speed on the market today. The three stripes have done it again with this exceptional Adidas Ace soccer cleat. Performance and style come together with a strong construction for durability, great traction and designed to be used on firm ground pitches, this is the shoe that will help you lift your game to the next level. The upper is made from synthetic materials that are designed to mold to your foot allowing for a snug and very comfortable fit. The low top of the shoe allows for excellent foot movement which in turn gives you more control over the ball at all times. The sock construction of these Adidas Ace cleats links the ankle to the lower leg allowing for faster, more agile movements. The insole of the Adidas Ace shoe is padded in all the right areas to allow for a comfortable ride, with protection in the toe and heel area. The insole is lined to prevent slipping of the foot inside the shoe. 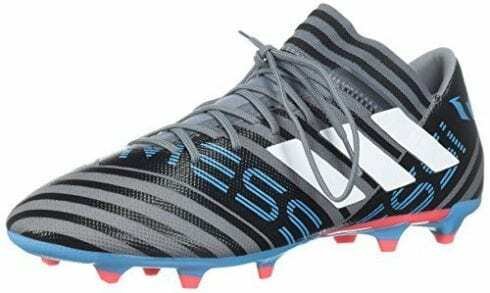 Traction on this great Adidas Ace Mens soccer cleat is phenomenal. The studs are designed and placed in just the right configuration to give you explosive push-offs and are designed for speed and agility on firm, dry, natural grass pitches. There is no break-in time required for these Adidas Performance Mens cleats. The techfit compression upper of the shoe which molds to your foot allows you to hit the field with confidence right out the box. The sock on the shoe enhances that snug fit that it offers and the low cut upper allows for exceptional movement in the foot and more control over the soccer ball at all times. The collar and fit of the cleats ensure that you remain stable and secure on your feet even when making tight turns. Adidas has always produced high-quality soccer cleats that help the soccer players lift their game to new levels and the Performance Ace 18.3 FG carries on that tradition in style. This great soccer cleat offers comfort, style, durability, and stability and will definitely be a stand out on the pitch. Suitable for firm ground pitches you get the best traction around coupled with ball control to give you that extra special shot taking ability. Having the best pair of soccer cleats that will offer you the traction, support, and stability you need when taking that all important shot at goal is priceless. The Beautiful Game is one of the most popular sports around the world and everybody loves to play, from men and women to children. Many manufacturers are using modern technology to design their soccer cleats to offer the best in traction which scientific stud configurations designed for speed players, defenders, and midfielders. They are also making their cleats more comfortable and supportive to prevent injury or foot issues from developing. A lot of professional players have also come to the party, giving their insight into design and structure of soccer cleats. If you are a serious player or just somebody who likes to kick the ball around on weekends, having the right soccer cleat will make your experience more comfortable and enjoyable. It will help you to lift your game to the next level and give you that added ability to control the ball properly, to shoot with more power and to dribble with dexterity. Even if your Adidas Mens soccer cleats fit comfortable first time, try to give them a little break-in period during practices before taking to the pitch for a match. This way your cleats will be sure to give you the best performance on the day. Nike is a well-known brand but not many people know the origin of the name. The shoe was named after Narki who was the Greek goddess who personified victory. If you want to read more about the importance of Soccer Cleats on different surfaces – read this study. 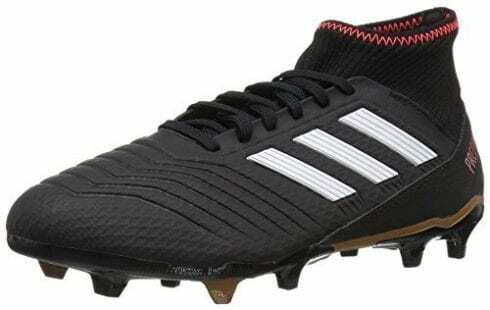 We hope you enjoyed our article on "The 10 Best Soccer Cleats", if so, please share and rate it.